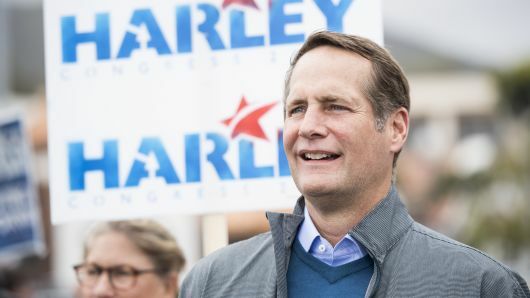 Harley is running to unseat Congressman Dana Rohrabacher, a corporate-funded climate denier who earned only 20 out of 100 on Food Policy Action’s scorecard. The 48th Congressional District is one of the most remarkable places to live in the world. However, as Republican leaders in Washington continue to deny the threat of man-made climate change, the pristine natural beauty which makes our home district so special is under attack. I will work to protect California’s most precious asset, our beautiful coastlines, from offshore drilling. We need to focus on consistently choosing clean energy over the fossil fuels of the past. As a businessman, I know firsthand that protecting the environment and incentivizing economic growth are not mutually exclusive goals, and that is why I support making Southern California the clean tech capital of the world. Clean energy innovation is not only better for the environment, but it also creates high paying jobs, economic growth, prosperity, energy choice and freedom from foreign dependence. And there is no better place in the world to unleash America’s clean energy potential than Southern California. We have all the ingredients: one of the best places in the world to live that attracts talented workers from around the globe; over 300 days of sunshine; a well-developed infrastructure; some of the world’s leading universities; an innovative culture; forward thinking municipalities; access to capital; and numerous high-tech businesses. Vote for Harley! To support his campaign, please contribute and get involved.